Top Ten Tips of ECG interpretation. 1. Don’t make an easy job, hard. Reading a good quality ECG, is easy. Add a wondering baseline, interference (electrical or muscular), or movement artifact, and it can be impossible. If it’s important enough to request an ECG in the first place, it’s important enough to request for it to be repeated if it’s illegible. Asking patients to hold their breath for a couple of seconds can help, or if fine tremor is a problem, try moving the limbs leads up to a more proximal position on the arms. 2. Switch off (or cover up) the computer interpretation. Possibly, one of the most common reasons for patients, with no cardiac symptoms, being referred to the Rapid Access Chest Pain Clinic is an inaccurate diagnosis of ‘Possible Anteroseptal infarct - probably old’ being made by the digital analysis. (See Tip 9). Most GP’s are aware that these computer-generated diagnostics can be over sensitive, but perhaps more alarmingly, is when cases of barn door Atrial Fibrillation, for example, are reported as ‘Normal Sinus Rhythm’. It happens. Whatever you do, don’t trust it. (Admittedly, once you’ve made you own interpretation, it can be reassuring to compare with the machine, but if different, don’t be afraid to go with your hunch). 3. Know your 4x tables! All you really need to know to spot a problem on the ECG, is your 4x tables. OK, and the normal waveform interval values. Assuming standard paper speed of 25mm/sec, then1 small square = 0.04msec. The rest is easy. 4. A quick rate estimation helps diagnose blocks, and ectopic activity. To calculate the rate of a regular ECG, simply divide 300 by the number of large squares between two complexes. Simple. For irregular rhythms, count the number of complexes between 30 large squares and multiply by 10. (30 large squares = 6 seconds, assuming standard paper speed of 25mm/sec). In irregular rhythms, it’s all the more important then to calculate both the Ventricular, and the Atrial rate, separately. This helps establish any mathematical relationship between them (use blank paper to map them out). This is a really quick way of spotting 2:1 or 3:1 blocks, dropped beats, or random ectopy. (see below). 5. Heart Blocks and Memory Blocks! P waves aren’t just about AF. The relationship of the P waves to the QRS complex, is the bread and butter of ‘heart block’ diagnostics. If the rhythm looks irregular, check for P waves (usually best seen, if present, in leads V1 and V2). If you can’t make out P waves, and it’s irregularly-irregular, then think AF. But, if you can see P waves, it’s useful to work out both the atrial rate and the ventricular rate, to determine any consistent relationship between them. Damaged myocardium (commonly age related or old infarct trauma), gives rise to heart blocks. Heart blocks occur when there is any interruption of electrical impulse either between its initiation in the Sinus node and subsequent atrial depolarization (Sino-atrial, SA block - see below), or during its journey between the atria and the ventricles (Atrioventricular, AV block). Both of these types of block can be further sub-divided into 1st, 2nd and 3rd degree. Click here for more information on heart blocks. Heart blocks, unlike Bundle branch blocks, indicate a non-sinus rhythm. a block in electrical conduction through the Right or Left branch of the Bundle of His. 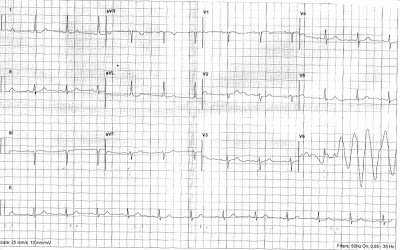 Any widening of the QRS complex beyond 2.5 small squares, should alert you to a total, or partial bundle, branch block. See more about LBBB and it’s causes. 6. Be very suspicious if you suspect Sinus Arrhythmia in the elderly. Sinus arrhythmia occurs with respiration in the young and healthy. The rise and fall of the heart rate is gradual, with respiration. In the elderly, sinus arrhythmia is rare. Study the R-R interval, if the distance is always a multiple of the basic rate, then a Sino-Atrial block is far more likely in this age group. A Sino-Atrial Heart Block occurs when there is complete failure of the sinus node to depolarise the atrium. In a sino-atrial block, the P-P interval remains regular but an entire P-QRS complex will be occasionally missing. 7. 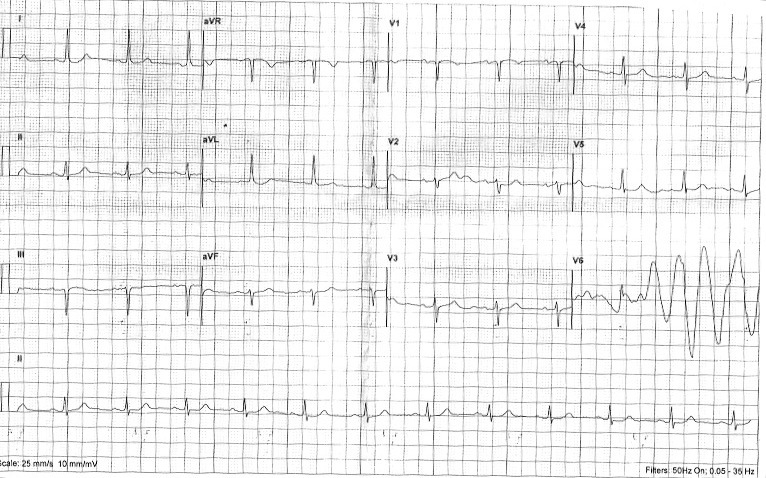 When considering LVH, don't just look at the chest leads. Interestingly, there is no one universally agreed criteria for Left Ventricular Hypertrophy (LVH) by ECG. Whilst LVH can only be truly diagnosed by ECHO measurement, there are various ECG ‘voltage criteria’ which can be suggestive of LVH. Hypertension and Aortic Stenosis, commonly cause an thickening of the an Left ventricular muscle, which gives rise to an LVH ‘strain’ pattern - a downwardly concave ST depression, with a flipped asymmetric T wave. Strain pattern is usually greatest in the lead with the tallest/deepest QRS. The Left ventricle is represented by chest leads v5 and v6, so in LVH, we expect the ‘R’ waveforms to be enlarged/tall in these leads. Conversely, we expect the ‘S’ waves to be deep in the right ventricular leads, that is V1 and v2). Many of us are familiar with the voltage criteria for LVH in the chest leads, i.e. the combined height/depth of the S wave (in V1 or V2) plus the R wave (V5 or V6) is ≥ 35mm. However, this measurement is very affected by body habitus of the chest wall – a tall slim man, with little chest wall adipose tissue, may well appear have 'voltage criteria' for LVH in the absence of any genuine hypertrophy. The limb leads are less affected by body habitus, so always take a glance at the amplitudes in Leads I and aVL. Even without voltage criteria being met in the chest leads, criteria for LVH is met if lead I ≥ 12mm, and/or lead aVL ≥ 11 mm. (As seen in ECG below). Of course the reverse applies too. So if you see massive deflections in the chest leads, but you wonder if this is down to the tall, thin habitus of the patient - just take a quick glance at leads I and aVL. If genuine LVH exists, then these leads should have large deflections as well. Remember, voltage criteria is cumulative, so the more leads which qualify for LVH, the more likely the accuracy of a diagnosis. 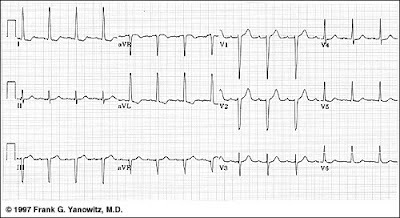 If the patient has no cardiac symptoms, past or present, and an assessment of risk factors makes likelihood of old MI seem remote, then take a close look at the ECG: Are there really any pathological Q waves? First thing to check is whether or not there is any positive upward deflection -no matter how small - which indicates an ‘R’ wave prior to the suspect Q waves (zoom in if possible). If so, the deep waves are ‘S’ waves, not Q waves at all. Secondly, what about the amplitude and width of the Q waves? 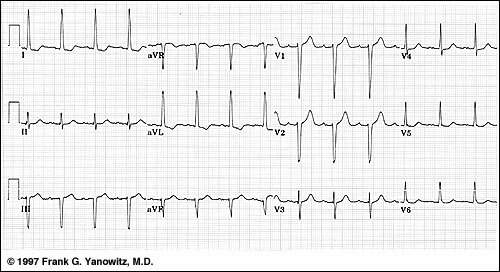 The precise criteria for pathological Q waves is much debated, but as a general rule of thumb the Q wave should be at least 25% as deep as the corresponding R wave is tall, and in at least two contiguous leads. The Novacode system further classifies ischaemic abnormalities in patients with no known history of myocardial infarction. 9. Bizarre ectopic waveform, or simple artifact? Remember, that each 'column' of leads on a 12-lead ECG trace, records the heart rate at the same moment in time, for all 3 leads in that column. So the first column simultaneously records the view from the limb leads (I, II and II). The recording will then switch to the second column, which in turn records simultaneous beats in the Augmented limb leads (AvR, aVL, avF). The third column records V1, V2 and V3 simultaneously, and the fourth records V4, V5 and V6. So, a genuine ectopic/anomaly will always appear in all three leads of anyone coloumn. A bizarre complex seen in V6 for example, (see image below) which isn’t present in V4 and V5, can only be an artifact - such as sudden movement of the electrode. Think of the ST segments in relation to the baseline. They should be described as isoelectric (i.e baseline), elevated, or depressed. So there you have it. Top Ten Tips to help avoid the common pitfalls in ECG interpretation. What’s wrong with computer generated ECG interpretation? Ann Intern Med. 2003;138:747-750 and Ann Intern Med. 2003;138: 751-760.